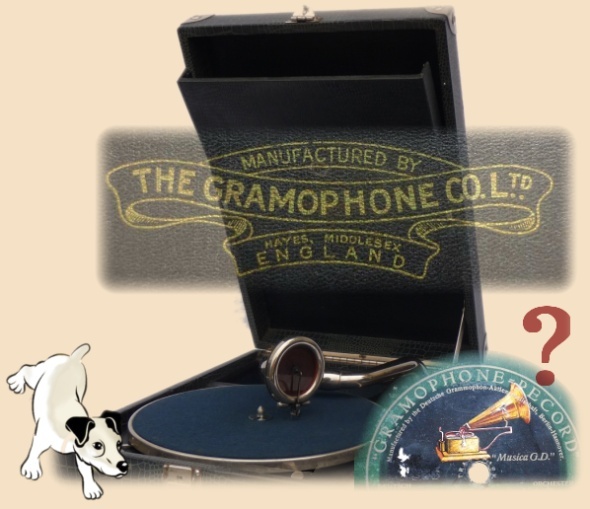 From time to time you´ll find in Europe Gramophones without the famous Trademark with Nipper, instead only with a lettering: “Manufactured by the Gramophone Co. Ltd. Hayes, Middlesex, ENGLAND”. 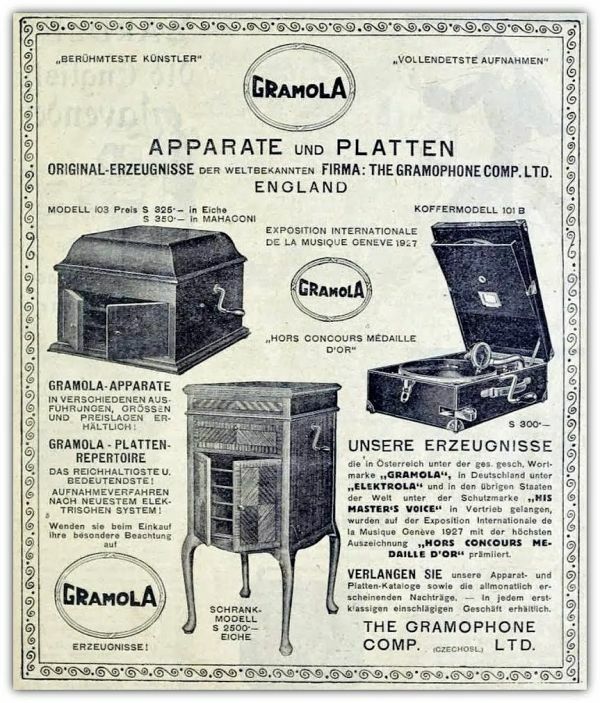 Also seen: A “Gramophone Record” with the Trademark machine – but, lost Nipper. What happened to little Nipper, where had he went? 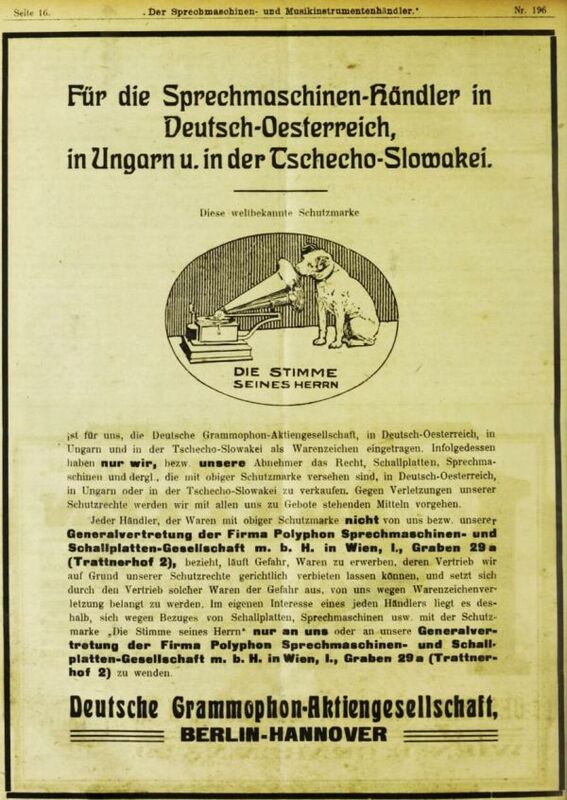 You´ll may find the theory that the Gramophone Co. Ltd. (HMV) used this in countries where dogs hadn´t been in favour. Of course, this is nonsense. 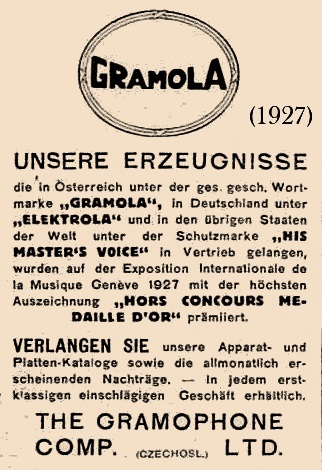 The story behind that is a little “Gramophone War” in Austria after WWI and the use of Trademarks. It is related to the trademark rights to the Nipper logo. 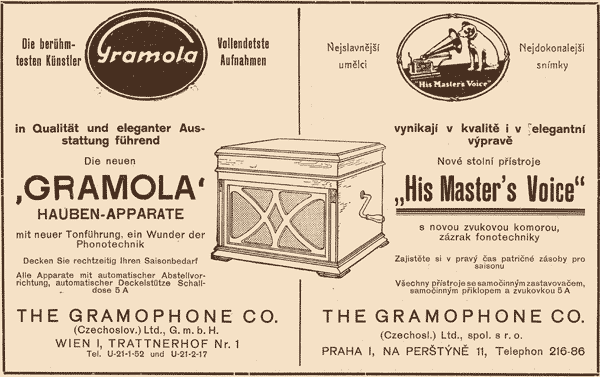 It is the trademark (without Nipper) that the gramophone company (HMV) used in Austria, Hungary and Czechoslovakia after WWI till early 1930. 1. 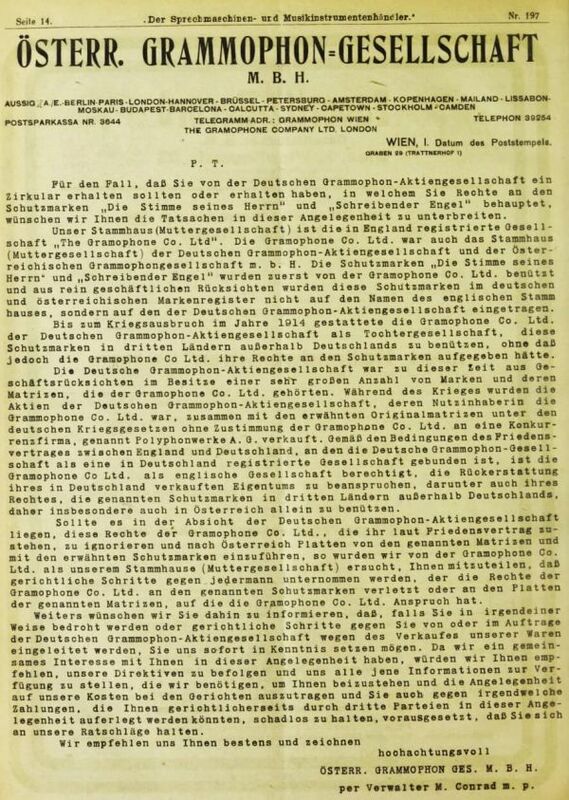 The “Österreichische Grammophon GmbH” (Austrian Gramophone Co.), still a 100% subcompany of the Gramophone Co. Ltd. (HMV). 2. The Deutsche Grammophon A. G., Berlin – Hannover, meanwhile without any connection to the HMV. Both claimed their right on the famous Trademarks “Nipper” (as a collimation mark) and “Die Stimme seines Herrn” (His Masters Voive) as the denominative mark in Austria, Hungary, former Czechoslovakia, Yugoslavia and the Ukraine. In late 1920 the dispute between the two company’s about the trademarks escalated in a open “War”. With big advertisement´s in the newspapers they claimed their rights and threatened retailers to confiscate the products of the particular competitor in the shops. 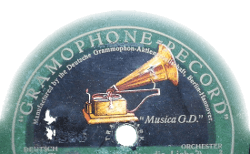 In December 1920 both company’s (HMV & DGAG) restored their self at court – the German Grammophon A.G. won the battle. From now on the HMV lost the right to use Nipper and the “Die Stimme seines Herrn” (His Masters Voive) as the denominative mark in Austria, Hungary and so on. Why? 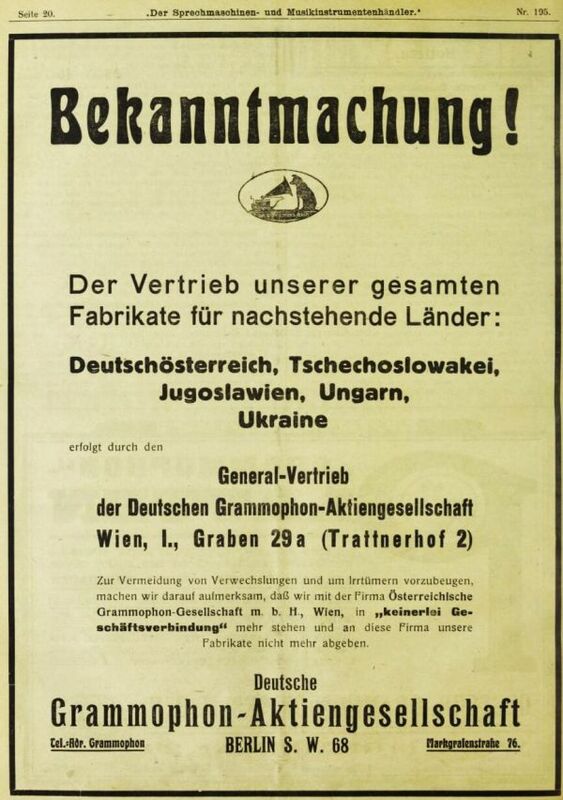 Before WWI this trademarks hadn’t been registered (in Austria) with the HMV, but with the German “Daughter” company DGAG! 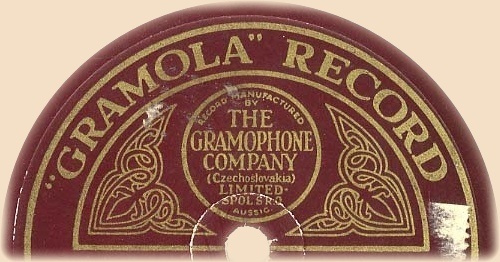 So, if you find a product with this lettering or “Gramola”, it has been made by HMV for the Austrian market. 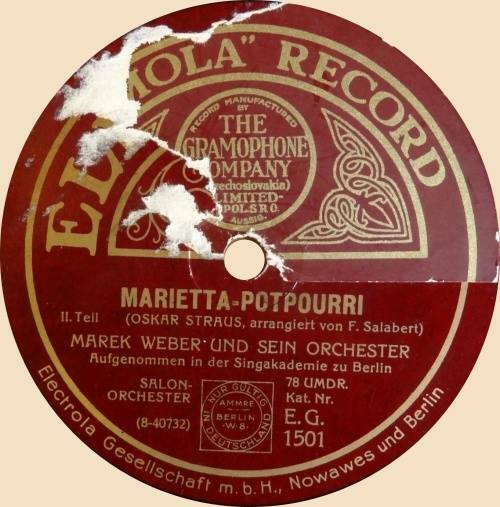 A German Electrola Record (HMV) with a pasted over “Gramola” Label for the market in Austria, Czechoslovakia and so on. In Germany the HMV used the name and logo "Electrola". In 1930 there had been a second trial – this time in London. Now the Deutsche Grammophon Aktien Gesellschaft (DGAG) lost… From the 31. January 1930 on, the HMV received back the rights with their old trademarks and “Nipper” in Austria. 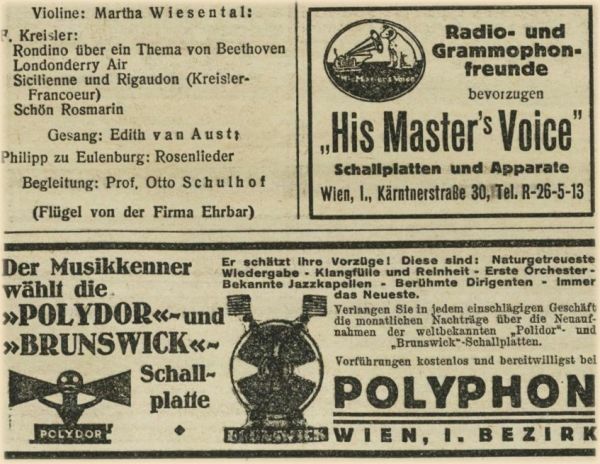 The DGAG now used the (Export) Trademark "Polydor" (Polyphon). And what about the Trademark without Nipper? Well... In other foreign countries, the DGAG hadn´t the rights with the “Nipper Trademark”. What did they do? They simply dropped Nipper around 1922/23 from the Labels… Of course this didn´t worked for long. They soon used their “Polydor” Trademark.